Ectoparasitoids of Embiidina (= Embioptera) nymphs. Pupation takes place in the host web. Olmi M., 2005. A revision of the world Sclerogibbidae (Hymenoptera Chrysidoidea). Frustula entomologica, N.S., XXVI-XXVII (XXXIX-XL): 46-193. Olmi, M., Marletta, A., Guglielmino, S. & Speranza, S. 2016. Protosclerogibba australis gen. et sp. 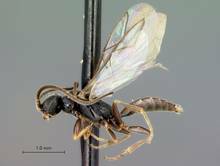 nov., new genus and species of sclerogibbid wasps (Hymenoptera: Sclerogibbidae) from South Africa. Zootaxa 4085: 127–134.